Toxic mold claims generally come in two forms: property damage caused by toxic mold and personal injuries as a result of toxic mold exposure. Toxic mold is more hazardous than typical mold or mildew growth because it produces chemicals called mycotoxins. Although mold is usually black or green in color it is usually not identifiable except by trained professionals. Toxic mold can occur in a home for a variety of reasons, including water intrusion into the home by a variety of sources such as a roof collapse or a water pipe bursting. When those types of accidents occur, toxic mold may grow because of the excessive moisture. In that situation, homeowner’s insurance company may be responsible to cover the cleanup of the water intrusion, the physical damage to the home and any resulting mold problems. The homeowner may be entitled to damages for personal injuries resulting from mold exposure, including illness or aggravation of an existing illness. In toxic mold situations suffered by a tenant in a rented condominium, apartment, or house, the property damage is limited because they do not own the home. However, if the tenant has renter’s insurance (which we highly recommend), then the insurance company may be responsible for the cleanup of the water damage, mold, and any damage to the tenant’s personal property and furniture. Damage for personal injuries caused by toxic mold is also a possibility. If your toxic mold claim has been unlawfully denied or your insurance company has acted in bad faith, it is important to hire a toxic mold insurance lawyer. 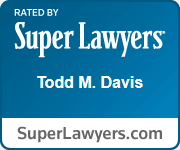 The Davis Law Firm is located in Jacksonville, Florida and serves clients throughout the states of Florida and Georgia, including Jacksonville, Miami, Pensacola, Orlando, Tampa, St. Petersburg, St. Augustine, Fort Myers, Daytona Beach, Panama City, Destin, Melbourne, Fort Lauderdale, West Palm Beach, Tallahassee, the Florida Keys, and everywhere in between.